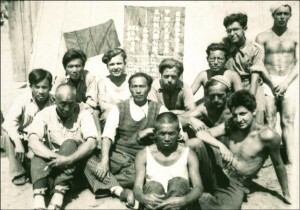 Chinese and other International Brigaders interned in the French concentration camp at Gurs. The Chinese brigaders lost twice. When the International Brigades withdrew, most of them suffered: many ended up (for as long as eight months) in the French internment camps (Argelès and Gurs), without help (or with belated and distrustful help) from their government. Almost immediately they continued to fight in the China that, after Mao’s victory in 1949, and after the Cultural Revolution, would harass all those who had had any contact with foreigners. Los brigadistas chinos perdieron dos veces. Cuando las BI se retiraron, la mayor parte vivieron un calvario: muchos dieron con sus huesos (hasta ocho meses) en campos de internamiento franceses (Argelès y Gurs), sin ayuda (o tardía y desconfiada) de su Gobierno. Sin demora, combatieron en esa China que desde 1949, con el triunfo de Mao, y tras la Revolución Cultural, acosó a los que habían tenido contacto con extranjeros. Read the whole article (in Spanish) here.